Your lawn is the first thing people see when they visit your home or business. You want your property to make a great first impression. Outdoor Innovations LLC offers a variety of services that will keep your lawn and landscape looking beautiful. Our philosophy is based on the belief that the needs and satisfaction of our customers is of utmost importance. As a result, a high percentage of our business is from repeat customers and referrals. Outdoor Innovations, LLC is a member of the New Jersey Irrigation Association, fully insured and licensed in the State of New Jersey. We welcome the opportunity to earn your trust and provide you with the best service in the industry. You have a lot invested in your home. 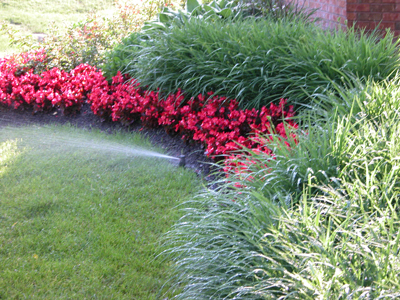 Keep it looking great while adding value with the installation of a new lawn sprinkler system. 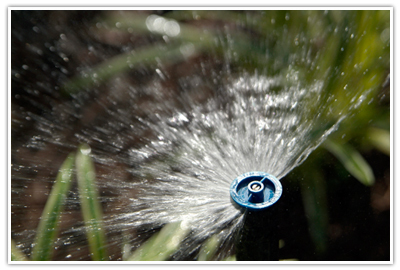 Lawn sprinkler systems help to beautify your property by giving you a healthy, green lawn you can be proud of. Proper drainage can help avoid damage to your home or property by helping move water away from foundations and low areas. A good drainage system can help avoid drainage issues before they become severe and costly. You've made magnificent improvements to your home such as a patio or deck, a beautiful walk, landscaping, or possibly an in ground pool. There's something missing if you can't enjoy showcasing these great additions in the evening as well as during the day. Outdoor lighting is an essential addition to your outdoor space. Installation of a well designed outdoor landscape lighting system will turn your dark yard into a usable evening oasis. Extend your living space by creating dramatic outdoor areas with outdoor landscape lighting and enhance the beauty of your home at the same time. There are many reasons why installing low voltage lighting is a smart idea. Among them, beauty and curb appeal, security and safety are top reasons. As well, the lighting is economical and energy efficient which is an added plus for homeowners considering this service. Outdoor landscape lighting can be utilized in many areas such as on posts, walls, landscape beds, mailboxes, decks, pathways, patios and driveways. Outdoor Innovations, LLC offers a variety of which can further add to your outdoor enjoyment such as rain water harvest systems and fog/mist systems. We even offer horse farm watering systems to provide convenience for farm owners. Contact us at 908-735-6226 for information about the services we provide. We provide services to most of New Jersey. Specifically Hunterdon, Somerset, Morris, Middlesex, Mercer, Essex, and Warren Counties.